Multiplicative numbers are, unsurprisingly, words used to multiply nouns. The numbers themselves can be adjectives or nouns – either way, their gender agrees with the nouns they modify / replace. 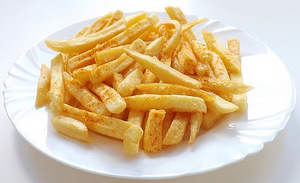 J’ai mangé une double portion de frites. I ate a double portion of fries. Il gagne le triple de moi. He earns three times more than I do. Only the first few multiplicatives are typically used in either French or English; beyond that, it’s more common to just say (nombre) fois, (number) times, or (number)fold. 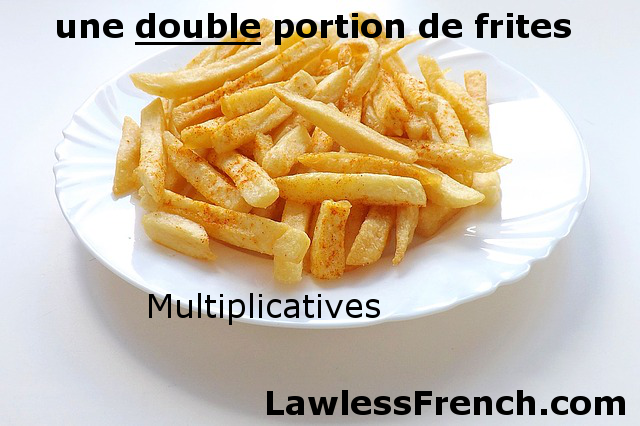 Multiplicatives have equivalent French verbs, but again, the higher numbers are rarely if ever used. Most of the names for multiple babies are based on multiplicative numbers.